Keep Our Lake Healthy - Inspect, Remove, Drain, Never Move! Submitted by: John Leach Aquatic Invasive Species educational outreach video. Inspect, Remove, Drain, Never Move! 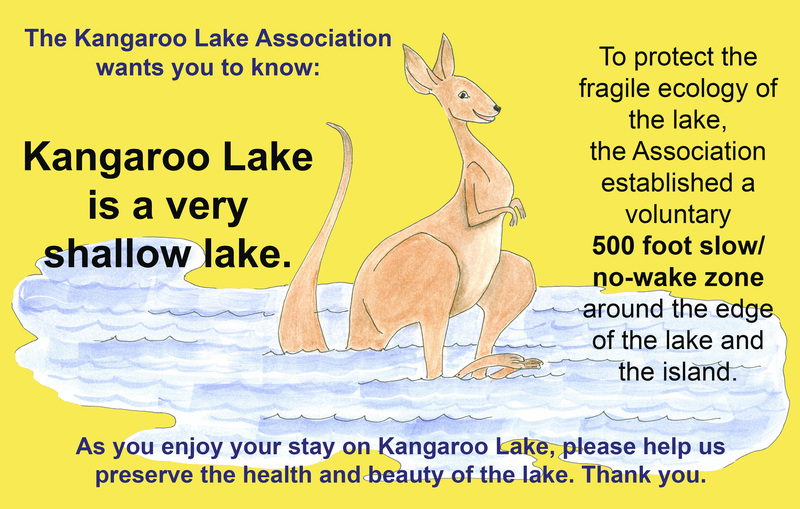 Welcome to our Kangaroo Lake Association’s website. Kangaroo Lake is a treasured gift of nature and we welcome all and hope you can learn more about enjoying this gift as we strive to become even better stewards of this jewel on Wisconsin’s Door County peninsula. Additionally, our members can access more detailed information about membership topics under the Members page. We encourage you to explore our website thoroughly. Since the 1920’s, many volunteers have cared for our beautiful lake. Past, present, and hopefully future volunteers and residents have passionately lived this mission of our membership association. Read about our history; learn about our lake’s eco-system; explore ways we all contribute to preserve and improve the quality of the water and all of the wildlife Kangaroo Lake supports. Our KLA has a strong membership with over 167 member households. We strive to improve the involvement and engagement of our members and neighbors that are part of the community that surrounds Kangaroo Lake. We invite anyone who owns property within one mile of Kangaroo Lake to consider joining our association as we together strive to live our mission. Learning about the lake’s shores and shallows areas including rock piles is encouraged for all, but especially visitors. On the “Boating”, "Explore", and "Learning" pages of this website, find maps and more detailed information that will assist those who are boating, fishing, swimming, hiking, and other outdoor adventuring.